To listen to Stephen Harper speak about a serious topic like illegal immigration and then listen to Justin Trudeau on the same topic, really isn’t fair. One is a serious and thoughtful man and the other is our current prime minister. It almost isn’t fair to compare the two. Stephen Harper has been making plenty of headlines lately. That includes for comments he made at a little publicized event at Stanford University last February. Since being discovered by the Canadian media, Harper has generated headlines about a book he is writing and how he could still be CPC leader if he wanted. I’ve played plenty of Harper’s comments on my radio show but it is his comments on immigration that stand out for me. 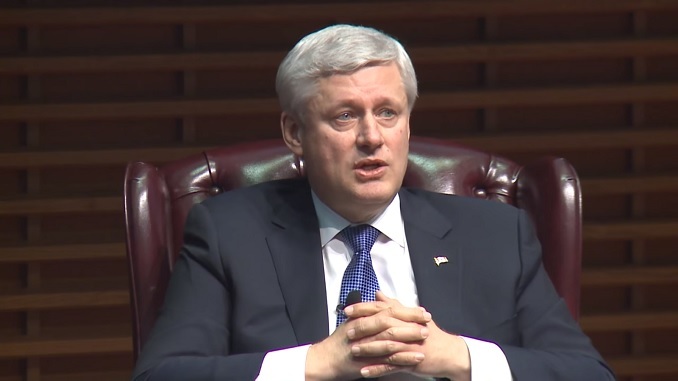 Harper was speaking to the Stanford Graduate School of Business when he was asked about Canada’s immigration policy and what lessons the United States could learn. Harper went on to describe how his government had progressively changed Canadian immigration policy, putting more emphasis on economic and workforce needs instead of family reunification. Specifically he pointed to allowing foreign students to stay in Canada if they found jobs in their fields while studying. A well thought out view. 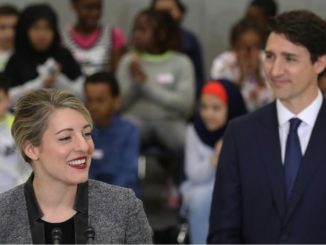 “I’m a strong, strong believer that immigration policy in the modern age must be based, to be beneficial for an economy, must be based on labour force needs and requirements,” Harper said. Harper said he is often asked in the United States and Europe how governments can make their immigration policies more popular, like in Canada. Harper said it comes down to enforcing the rules and the rule of law. “If Canada had a huge percentage of, as you do in the United States and Europe, a huge percentage of it’s immigrant population was here illegally, or irregularly – outside the law – it would not be popular. Illegal immigration is not popular anywhere in the world at any time,” Harper said. Harper went on to say that it is “way too difficult” to become a legal immigrant and “way too easy” to be an illegal immigrant in America. Now let’s look at Trudeau. When the PM was asked about the illegal border crossers last week by Conservative MP Ziad Aboultaif, an immigrant from Lebanon, his answer was weak. Aboultaif asked Trudeau what he would say to newcomers that had followed the rules. 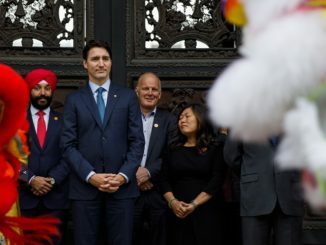 “Once again we see the same divisive approach from the Conservatives, pitting newest arrivals against recent arrivals, pitting one community of new Canadians against another community of new Canadians, “Trudeau said. Is it really sowing fear and division to ask that all people be treated the same by the government? I grew up in an immigrant family, in an immigrant neighbourhood, I can tell you nothing pisses off legal immigrants more than people that break the rules. We know the Trudeau government knows the current crop of border jumpers are not real refugees. If they thought differently they wouldn’t be asking the US government to change visa rules and wouldn’t be sending a delegation to Nigeria to try and stop this. Trudeau and his Liberals know this border crisis is a real issue but they have no plans to fix it. Instead I believe they will try to use this issue politically, as a wedge issue against the Conservatives. Just as the Democrats used to be against illegal immigration but switched sides, Trudeau and his Liberals will do the same. In the next election, Trudeau’s Liberals will use any chance they have to paint Conservatives as racists for speaking up about border control. Given that most journalists don’t spend much time thinking, they will dutifully repeat the assertions and divide Canadians. The questions is whether it will work? In the United States fixing the border and illegal immigration has support from Republican and Democratic voters. The thing is no one believes anyone will do anything so it has ceased being the wedge issue it once was. In Canada that is yet to be determined. But mark my words, Justin Trudeau will campaign for illegal immigrants in the next election. Another good column Brain. Your work is excellent! Justin to campaign on more immigrants, legal and otherwise is a great idea. Quebec and Ontario need far more muslims than they have now. We need NO-GO zones in Toronto and Montreal just like they have in the oh-so smart and advanced, European conglomerate. You know, where they have had to ban knives along with guns .. to pretend they are actually protecting their citizens from the much loved and respested muslim immigrants who just can’t stop killing the infidels. Thank you kindly for posting this.That was a totally awesome interview. As far as I am concerned, Mister Harper was a very good, smart and a brilliant leader. Laws should be enforced equally. When laws are enforced unequally, it creates confusion in the country. With confusion comes a sense of instability, which in turn affects the people’s inclination to invest their savings in the economy. It is one of the many steps used by ideologists to make us dependent on the government. He also seems to have been oblivious to the “Deep State” which is just as toxic here as in the U.S. Conservatives seem to have chosen to ignore the two allied death cults attacking CANADA, even suppressing freedom of speech and thought among membership. Though they had the opportunity to defund the CBC and relieve us of vile mental health abuse by that Leftist propaganda burden on conservative taxpayers they left it to prey on us! Donald Trump actually takes flack for his supporters and fires back. CPC cowers. Only a leader of Harper’s caliber who makes decisions using common sense can save Canada from becoming a third world country. One more term of Trudeau and the Liberals will make it impossible for us to recover from our massive debt and from the conversion of the country to Islam and Sharia law. Hopefully Canadians will start paying attention to what is happening and get out on election day in masses to free us from the madness being foisted on us by the Liberals and Trudeau. I miss Stephen Harper dreadfully. He is the best PM we have had in my life time – 78 years. I cannot believe people voted for the bloody Turdeau His father ruined Alberta for a decade or more and he has now done the same. He is incompetent. There should be one law for everyone in Canada. None of the wink wink, nudge nudge …turning a blind eye for some people. Trudeau said an oath to uphold our laws and is breaking it. So refreshing to listen to an articulate leader for a change instead of the train wreck Trudeau. Here is a man who can actually form coherent and pertinent thoughts on his own without the prepared script that Trudeau needs from his speech writers. I loved his comments re no country in the world embraces illegal immigration and that is it detrimental to a country’s success.